This past weekend, the market was full of bright, colorful summer squash. I picked up a few baskets of yellow squash and zucchini and was inspired to make zucchini bread. I had so much zucchini on hand, I didn’t want to make just one big loaf… so the experimentation began. I used two recipes in mini loaf pans, one highly rated one from Fine Cooking, and one healthier one from Simple Bites. Then came the taste test — and there was a clear cut winner (my mom, my dad, and I all favored one bread over the other). I assumed everyone would love the Fine Cooking version, because of the stick of butter, the coffee essence, and the eggs… however, the healthy version won. Today I learned that the healthy version can actually be the tastier version. I also learned that my mom is not a fan of chocolate chips (go figure?). So next time, I will use some pecans instead. Zucchini bread makes the perfect cloudy day treat. I like to toast slices of this fragrant quick bread and spread with a little bit of cream cheese. I have seen variations such as banana zucchini bread and lemon zucchini bread — have any of you tried those? Preheat oven to 350°F. Oil a 9×4 inch loaf pan and line with parchment paper. Line a 6-cup muffin tin with papers OR oil a mini loaf pan. In a bowl, sift together dry ingredients and set aside. 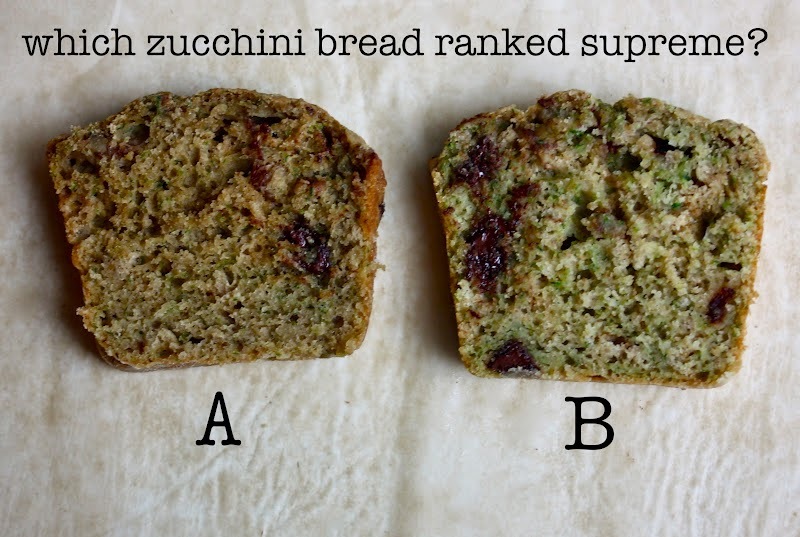 zucchini, chocolate, bread… get in my belly! !